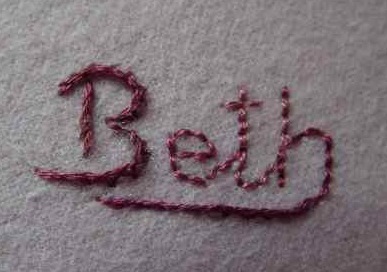 A name, or initial, has always made a great hand embroidery for beginners project! Embroidering your name on household linen ensured it returned home after laundry. Girls learned their alphabets while stitching letters on their samplers. It is still a good way to teach needlework to younger people. You can personalize something, even if you only know a few basic embroidery stitches..
On this page we will cover how to get your letters onto the fabric and some simple stitches to use. So what can we stitch names on to nowadays? Iron on transfers won't wash out, so you will need to cover the lines with your stitches. A light box is a smooth surface with a light behind it. When you place your template and garment on top, you will be able to see through the fabric. You can then trace the lettering with a disappearing ink pen or a graphite pencil. Don't have a light box? Use a window instead. The window will only work during daylight hours of course. Transferring to fabrics with a "nap"
The methods above won't work on textured fabrics such as baby's blankets or toweling. The deep pile or nap does not lie flat enough to get a good result. A good method to use here involves tissue paper and tacking stitches. You would first write the letters onto the paper, with care! Then position the paper over the garment. Using contrasting colored thread, stitch over the lines with a straight stitch. You can then tear away the tissue to leave a guide to follow for your embroidery. The best stitches to use will depend on the size of your letters. Small words look great just outlined. You might like to get more creative with larger initials or monograms. There are a variety of filling stitches that work well for these. I suggest you start with outline stitches. Backstitch and stem stitch work well for the name shown in the photograph. 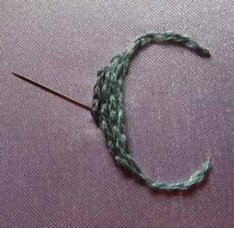 Stem stitch gives a thicker line for the first letter and the line underneath. It is a stitch often used in redwork embroidery. If you want to create letters that vary in width, split stitch is a good choice. You can work a single row in the thinner sections, and add extra in the wider parts. 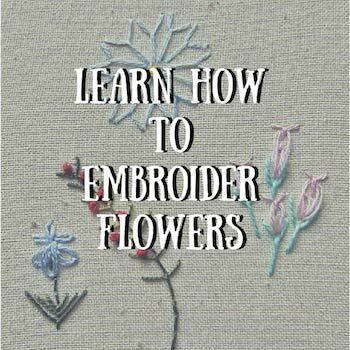 It is a great introduction to hand embroidery for beginners. I recommend using a hoop for split stitch. You then have both hands free. Thread your needle with an even number of strands of embroidery floss. Start by bringing the needle up through the fabric from the back. Take it down a stitch length away. You don't want to make each stitch too big - half a centimeter is large enough. Bring the needle back up through the center of the previous stitch. 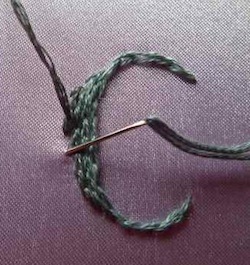 Try to have the same number of strands on each side of where you split the stitch. This will give the neatest result. Take the needle down half a centimeter away from its current position. Repeat this, splitting the center of the previous stitch each time. 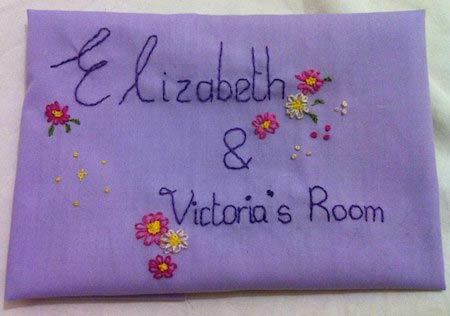 You can also use the split stitch to outline a letter then fill it with satin stitches, which helps give a neat edge. Keeping the satin stitches laying smooth can take practice, but it is worth persevering. 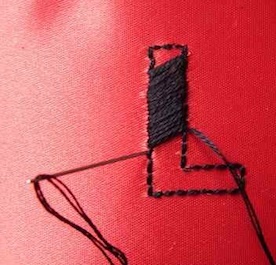 Try to avoid making your satin stitches too long, as they are liable to catch or snag. Padded satin stitch consists of two layers, often worked in different directions. It gives more dimension to your hand embroidery. For beginners, I would stick to just the first layer. 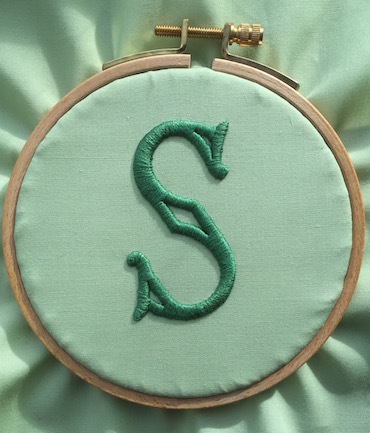 With more practice you can work over a cut out shape to create a raised satin stitch letter, as shown here. Felt or a stiff interfacing work well for this technique. These are just a few stitches that you can use for lettering. To learn more stitches do check out my basic embroidery stitches page. 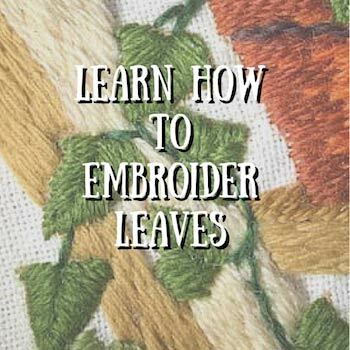 You will find more hand embroidery for beginners projects by clicking on the picture links below.